This week, with celebrations to mark the 40th ‘Birthday’ of the Sydney Opera House, it is a perfect time to examine the history of the point on which it is built, Bennelong Point. The postcard above, from circa 1906 shows just one era in the history of this important place. Bennelong Point has its first appearance in the history of European settlement in 1788 on the 25th of January, when Captain Arthur Phillip anchored the HMS Supply nearby. Only a year later, Captain Phillip captured the Aboriginal Bennelong who became an important intermediary between settlers and Aborigines. In 1791 a hut was built for him on what became known as Bennelong Point. By the 1820s, the area had been decided on as the site of one of Sydney’s defences and in 1821 Fort Macquarie was completed where Bennelong’s hut had once stood. 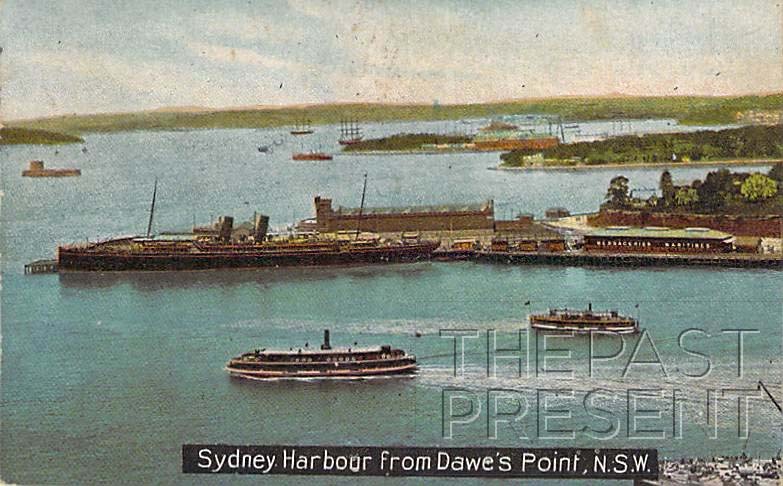 In 1902 the function of the point changed again, with Fort Macquarie being replaced by the tram depot shown in the postcard above. The tram depot was remarkably grand for such a functional building, with the design paying homage to the history of the point as a fort. In the 1940s, Eugene Goossens began to campaign for a theatre, capable of staging large productions. He insisted that Bennelong Point was the perfect location. In 1955 a competition to design the building was launched and the tram depot was closed. The winning entry, by Danish architect Jorn Utzon was announced in 1957 and a year later the tram depot was demolished to make way for the famous building which today occupies the site. Construction of the Sydney Opera House began in 1959 and the building was opened in 1973. The image above, from the collection of an unknown photographer, and dating to circa 1936, is a fascinating view on a much more rural Sydney than we are familiar with today. 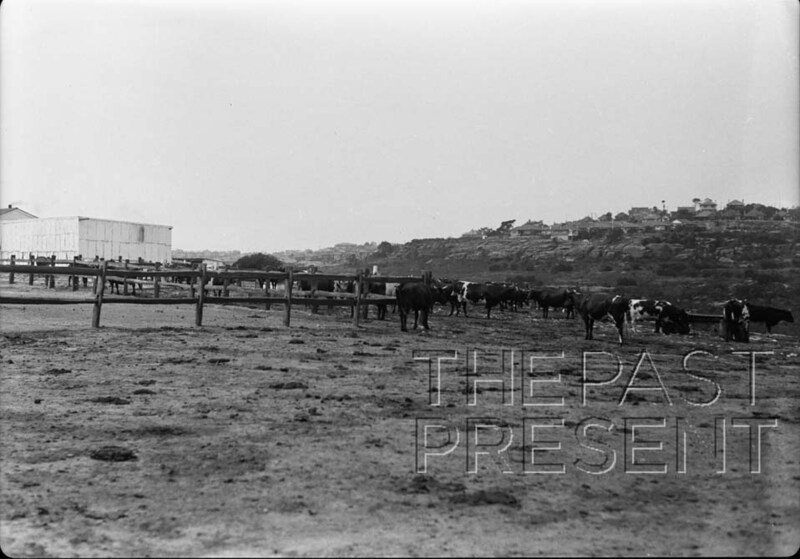 This photo shows Folly Point in Cammeray, but as you can see, the area was once agricultural. According to the description accompanying the photo, this image shows a small dairy at Folly Point. Not far from North Sydney, which was well established as a town and commercial centre by the 1880s, Folly Point and Cammeray were slower to develop due to the steep topography and distance to easy transport. In fact, Folly Point remained a rural, agricultural area, in the heart of the growing city. It was an area of vegetable farms and particularly of dairies, with dairy cattle reported grazing in the area as late as the 1950s! Today it is one of Sydney’s more exclusive residential suburbs. The image above, from a 1930s postcard, depicts a Rose Bay which is long gone, but which lives on in many people’s memories. Rose Bay Flying Boat Base was home to the Qantas Flying Boats which were, pre and post World War II, a luxurious way to travel overseas or around Australia. 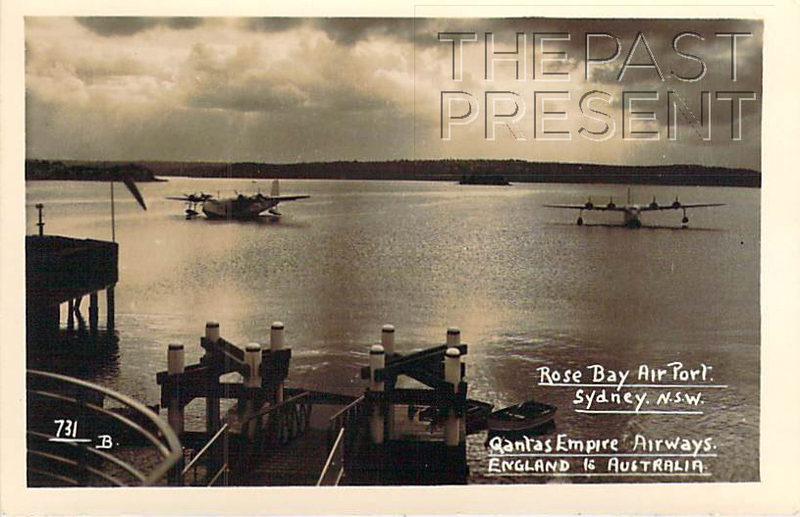 Although the flying boats many people remember best were the Catalina’s, one of which some might have seen in the recent International Fleet Review fly over in Sydney, the postcard shows some of Sydney’s first flying boats, the Empire Class. The first of the Empire Class flying boats arrived in Sydney in 1938, just before war broke out, while the Catalinas actually arrived during World War II. The flying boats were used extensively in the war effort, but were almost obsolete following the war, as other planes were now able to make the long flights for which they had been used, but more quickly. Soon they were being used once again as a slower but more luxurious way to travel. Many Sydney residents may also remember the flying boats through Sammy Sparrow who was a regular feature on Garry O’Callaghan’s 2UE radio program. Sammy Sparrow would come on air at about 8:15am to entertain young listeners who were about to leave for school. My Mother remembers that when Sammy and Garry said the flying boat was coming in to land, it was time to leave. When Sammy married another Sparrow, Eleanor, the flying boat carrying them off on their honeymoon flew low over Sydney. The flying boat service ceased in the 1970s and Rose Bay Flying Boat Base closed in 1977. This week, with the International Fleet Review underway, the Past Present decided it was time to delve into the collection of tourist and photographic books to see if a photo of the original Fleet Review might be found. The current Fleet Review commemorates the Centenary of the entry of the Royal Australian Navy into Sydney Harbour in 1913. Although there had been an Australian Squadron in the Royal Navy since 1859, and the separate Naval forces of the states were unified by Federation in 1901, becoming the Commonwealth Naval Forces, the Royal Australian Navy itself was not created until 1911. On October 4 1913, exactly 100 years ago today, the Australian Naval Fleet entered Sydney Harbour for the first time, with Sydney residents lining the shore to welcome the ships, led by HMAS Australia. This image, a panorama from the book 85 Picturesque Photographic Views Of Sydney And Surroundings was published in 1913 and appears to show the original Royal Australian Navy Fleet entering Sydney Harbour. The book does not directly indicate that the ships are part of the Navy, but the year, 1913, the crowd gathered watching the ships and comparison to photos of the ships which were part of the Fleet suggest it is likely.